Jazz legend Bill Crow is a generous man. Not only was he kind enough to grant me permission to reproduce the above photo on today's post, but he spent some time answering a few questions that I thought would be of interest. Rarely on this blog do I explore the Italian motor-scooter aspect of the 20th Century modernist dispora, but this wonderful photo deserves some extra attention. "I was living at 22 Cornelia Street in Manhattan in those days on the second floor. Cornelia Street only had parking on the east side and when the city went to alternate side parking, that street was only park-able on Tuesdays and Thursdays. I was driving an old Ford and was having so much trouble parking it that I sold it. I knew the writer Arnold Perl, who had a Lambretta over in the East Village. It may have been the first one in Manhattan. I realized that I could wheel it through my building and park it in the back yard so I bought one, their smallest model, from an agency in the west 50s that was selling them and figured out a way to carry the bass on it. I carried a small board with me that I could use to help me wheel the scooter up the three steps on my stoop at 22 Cornelia and I would chain it to a tree in the back yard." "At that time I was working six nights a week at the Hickory House on West 52nd Street and I left my bass there every night unless I had a record date or something. It was nice to ride the scooter midtown from my Village apartment and I could park it easily at the curb. I only carried the bass on it when I had a different job. While I was still living on Cornelia Street, the movie photographer Aram Avakian (George Avakian’s brother) shot a lot of footage of me carrying the bass on the scooter, which he intended to use in a documentary that he was planning about New York jazz clubs, but the film was sent to some funding organization in an appeal for a grant and I never heard any more about it." "I took it camping one autumn, when Marian McPartland took 3 weeks off from the Hickory House to go home to England for a visit. I packed a pup tent and a sleeping bag on the luggage rack and drove up through the Adirondacks, up into Montreal, down along Lake Champlain, up to Baxter State Park in Maine, down to Acadia National Park, and on down the coast to Boston, where I met Marian who came back from England via Boston to visit some friends. We had lunch together and then I headed back to NYC. I stayed on the smallest roads I could find which still had a hard surface and really enjoyed seeing the northeast that way." 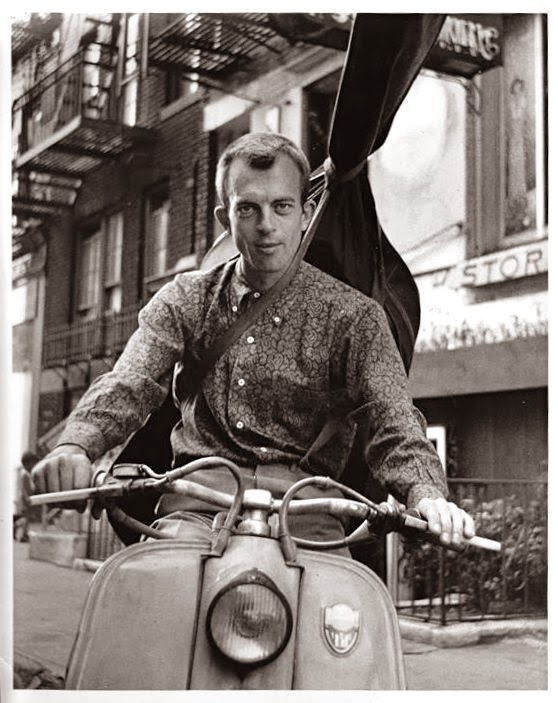 "When I went to Italy around 1959 with Gerry Mulligan, I went to the Lambretta factory in Milano and bought a new scooter and had it shipped to New York. I sold the old one and I kept the new one in a garage on 7th Avenue next to Nick's. In the early 1960s I moved to West 20th Street in Chelsea and found another garage nearby where I kept the scooter chained to a water pipe." "When I returned from a later trip to Europe with Mulligan, I went to pick up the scooter and found that it had been smashed against the wall of the garage by a car or truck. The garage men claimed to not have noticed the damage. Their insurance company finally paid for the repairs, but I had already decided to buy a Volkswagen and I sold the scooter." Thanks once again to Bill Crow for his time and consideration. It is truly an honor to have made his acquaintance via the internet. **A footnote: according to Lambretta's official history; founded in 1947, the Milan, Italy motor-scooter manufacturing company did not start its USA division until 1955. Lambrettas were only available in a few American cities and in very limited quantities before that time. 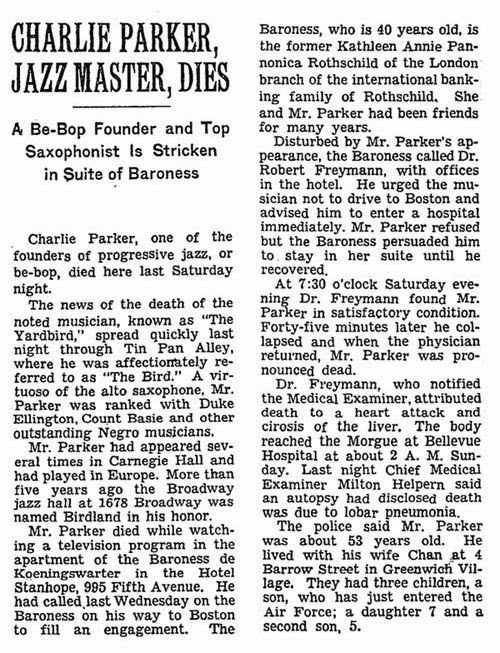 The death of Charlie Parker on March 12, 1955 had both an immediate and lasting impact on the New York art community. It wasn't just the musicians who grieved and grappled with the truth that Bird was dead, the painters and poets too strongly felt the loss of one of their idols. He was a hero made flesh: many of them knew Parker as much from seeing him around their Greenwich Village and Lower East Side (there wasn't an East Village yet) neighborhoods as much as they did from his stage appearances. Of course, they knew his records and would check him out at The Open Door on West 3rd Street when they could afford to do so, but the notion of the starving artist wasn't a punchline once upon a time. According to the somewhat controversial record producer and writer Ross Russell, who owned Dial Records and who recorded some of Parker's most critically acclaimed music, within "a few days of the alto player's death there appeared among the graffiti on the walls in the Village and in subways, scrawled in black crayon or squirted out of pressurized paint canisters, the legend 'Bird Lives!" 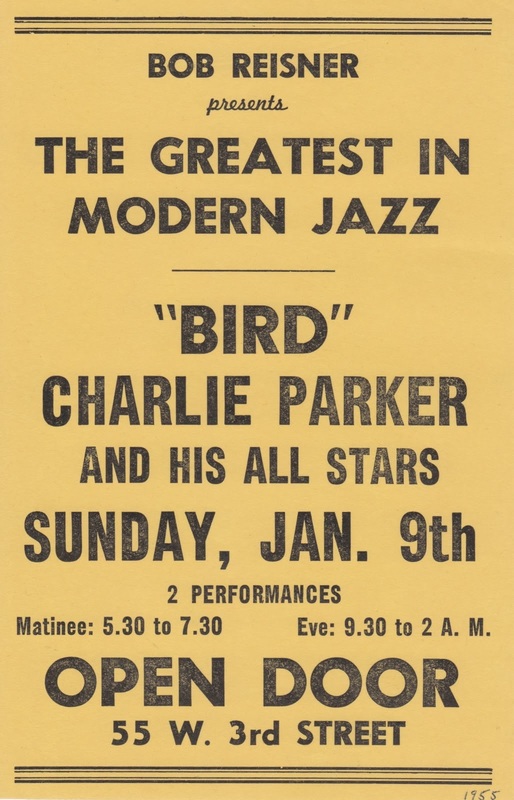 (Bird Lives: The High Life and Hard Times of Charlie (Yardbird) Parker by Ross Russell, New York; Charterhouse, 1973). 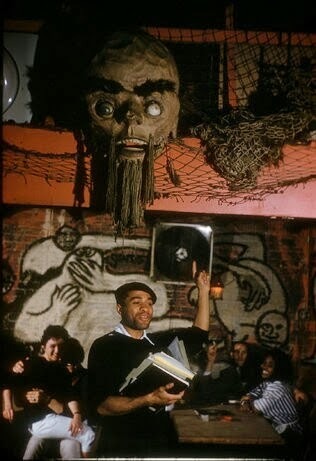 Years later it was poet Ted Joans who was credited as the instigator of the graffiti. Ted Joans knew Charlie Parker and knew him somewhat well. Not too long after Joans arrival on the scene, he become known for his elaborate parties often costumed affairs. Author and promoter of the 1950s jazz sessions Robert Reisner claims that Bird turned up for one of these parties dressed as a Mau Mau and supposedly the January 1955 issue of John Preston Davis' groundbreaking African-American journal Our World featured one such party with Parker visible in the background. After returning from an extended engagement in Chicago in that same month, Bird was more or less a transient who relied upon the goodwill and couch space of others for shelter. At the time Joans shared a small apartment at 4 Barrow Street in the Village (don't go looking for it, it has been razed) just off of Sheridan Square and across the street from the Cafe Bohemia (that building is still there, occupied by the Barrow Street Ale House) and his roommate Ahmed Basheer brought a sick Parker home one night after finding Bird sprawled out on the sidewalk near their front door. As a result, Parker and Joans were de facto roommates off and on during last 2 months of the saxophonist's life. But just calling Ted Joans a poet is doing his legacy a disservice. Yes he was indeed a poet. In fact, he is now often referred to as one of of the original beat poets. Joans moved to Greenwich Village in 1951 around the age of 23 having moved to the big city from Illinois by way of Indiana University. Sadly, the history of the Beat Generation seems to have suffered from some degree of whitewashing as Joans seldom appears as more than a mere footnote. 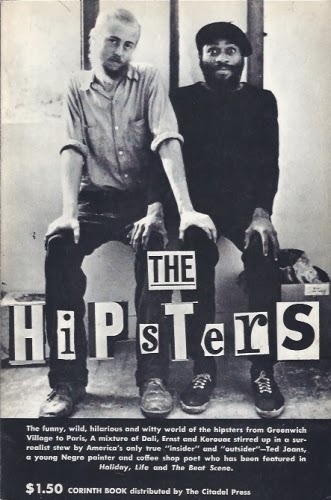 But he was clearly one of the first on the scene, connecting Gregory Corso not long after his arrival. He would later cite his biggest influences as Langston Hughes and André Breton. 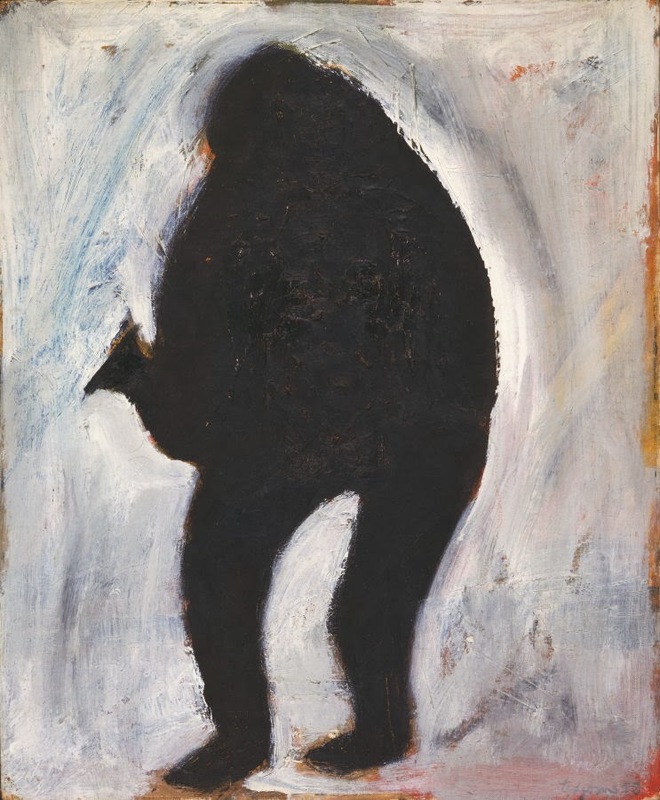 For his part, he thought himself as much as surrealist as he did a beatnik, although he certainly took advantage of the public interest in the latter as a way to have a forum for his art. By the time of his death in 2003, Joans had authored well over 30 books a remarkable body of work for any poet by anyone's standards. Joans creativity did not end with the printed word. At one point of time he was a trumpeter, although he reportedly threw his horn off a bridge as he felt the need to focus on other aspects of his life (this again according to Russell). 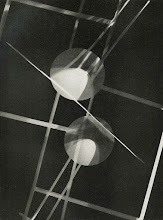 He was a visual artist as well. Although largely known as a recluse, Joans befriended the Jackson Pollock and got to know the painter before Pollock died in the Summer of 1956. Joans most certainly was a painter, although examples of his work are relatively scarce both online and in the real world. However, one of his surviving works is from 1958 and is fittingly (for our story at least) titled Bird Lives! The is only the tip of the iceberg that is the fascinating story of Ted Joans. I highly recommend digging deeper. Bird Lives! the painting is featured in San Francisco's de Young Museum Shaping Abstraction exhibit now through January 4, 2015. As a teaser, here are a couple of short films that feature Joans a few years after the death of Charlie Parker. Bird Lives indeed!